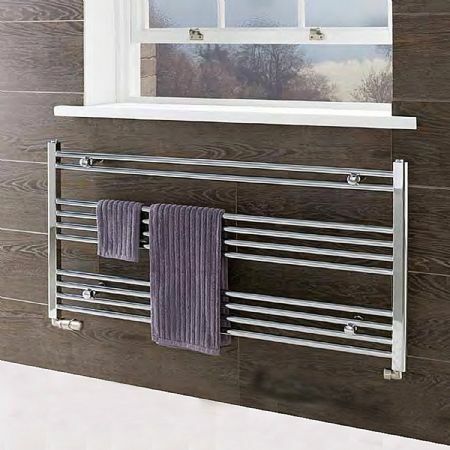 Utilise the usually dead space beneath a bathroom window with one of our under-window towel rails. Designed to be low and wide, these heaters will fit below almost any window, and not only help heat your bathroom but will also keep your towels warm! Our under-window heaters are 600mm high, and come in a choice of other widths (750mm, 1000mm & 1200mm). The stylish chrome finish will blend in with your taps, shower and other chrome fittings in your bathroom. Tappings are approx 50mm less than the width of the rail, tappings off wall are approx 70mm. Radiator valves are not included.